At Dr. Ross Palioca’s practice, patients in Wrentham, MA and the surrounding areas can enjoy the advantages of quality care and attention by a dental professional who has years of experience. At Advanced Dental Practices, we provide solutions for individuals who want to achieve beautiful, healthy smiles for life. By investing in CEREC technology in his practice, Dr. Ross Palioca can provide same day restorations such as porcelain crowns, inlays, and onlays to repair the smile. Dental restorations are porcelain pieces made to repair the smile when damage has occurred. Chips and cracks can cause the dental pulp inside of the tooth to become exposed, increasing the risk of disease or infection. Patients who have had procedures such as root canal therapy may require the placement of a dental restoration such as a crown because the treatment can make a tooth brittle, causing it to become more susceptible to further damage. Dr. Ross Palioca can advise patients as to the times when restorations such as dental crowns may be beneficial. Why choose crowns, inlays, or onlays? Crowns are used to protect a tooth that may have become weak. This means covering a tooth that has had endodontic treatment or has had a large cavity filled. Crowns cover the entire tooth, while inlays and onlays are more conservative and can cover smaller areas where composite resin bonding cannot be used appropriately. Our professionals can assess the smile and the specific situation to make a recommendation as to how to proceed. Dr. Ross Palioca is proud to offer advanced solutions for his patients, including integrating CEREC technology into his services for dental restorations. CEREC is a specialized CAD/CAM device that uses computer software to fabricate restorations right in the dental office. 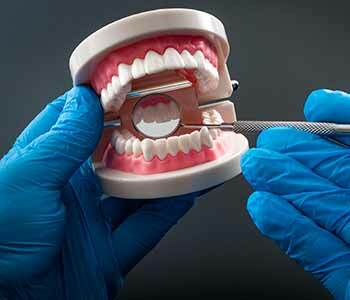 For other dental practices, patients would have to have their tooth prepared and molds made. Then, a temporary crown, inlay, or onlay would be placed onto the tooth while the impressions are sent to a dental laboratory often states away for the completion of the final restoration. Then, patients must come back for another appointment weeks later to remove the provisional restoration and replace with the permanent one. This takes much more time than Dr. Ross Palioca would like. So instead, his practice utilizes CEREC technology to provide patients with same day solutions. Patients rest in the treatment chair while their tooth is prepared, then the impressions are digitized into the system. A porcelain block is put into the milling machine, and the software allows the device to create the restoration while patients wait. 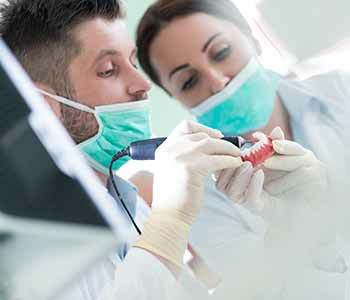 This is amazing technology that is not offered in every dental practice, setting Advanced Dental Practices apart from other dentists in and around the community. What is the benefit of using CEREC technology in the office? Patients can enjoy same-day restorations and eliminate the wait needed for their final repairs. Patients do not have to deal with a temporary restoration. Patients do not have to come back for a second dental appointment to complete the process. Patients can get their restorations done the same day and get back to their life without interruptions! Patients can rest easy knowing their restorations will be accurate and fit precisely the first time, knowing there is no room for error with precision software and imaging. Want to learn more about dental restorations made with CEREC technology? Contact Dr. Ross Palioca today for an appointment. Our team of professionals at Advanced Dental Practices are here to assist patients with a variety of cosmetic and restorative procedures meant to improve dental health and the appearance and function of the smile. We encourage patients to take the time to find out about crowns, inlays, and onlays by a trained and experienced dental professional by calling (508) 456-7111 to connect with our team. We are conveniently located at 21 East St. in Wrentham, MA but also serve patients in the areas of Walpole, Franklin, Plainville, and Foxborough.